My homage to the 14 fret small body all around player. Reminiscent of a Martin OOO/OM or Gibson L-OO. I’ve fallen in love with many a custom shop and vintage guitar over the years that has a tight narrow waist which aids so much in the comfort and playability factor, yet is still deep enough to produce a nice present low end. The overall balance lends itself to a great fingerstyle and blues guitar and is perfect for that singer songwriter that needs a rich lush accompaniment that won’t overpower the singing. I voice my guitars so that they are extremely receptive to the subtle dynamic and tonal choices that a seasoned player can bring out in his/her music. 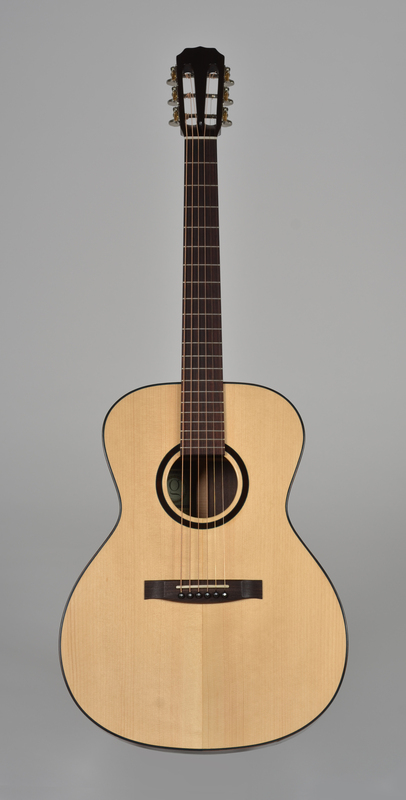 The sound is open and woody with a large dynamic range and holds up amazingly in dropped tunings.